Welp, I know how Jeter must feel … this farewell tour has been exhausting. But I’m so thankful for my supportive family and friends who’ve put up with me these last few weeks — I promise, the dragon lady will be extinct once I’m settled in San Fran! MTA: Oh, how I love to hate you. But when it’s all said and done, I am honestly amazed that 9.5 million people are transported via the subway, buses, LIRR, and Metro-North. Keep on keepin on’, Old Faithful. Times Square: See above re: love to hate. My NY experience would be nothing without the absolutely insane environment I face every workday. It’s magical to tourists for a reason, and I hope to enjoy visiting it in the future. Allison Turns 1! 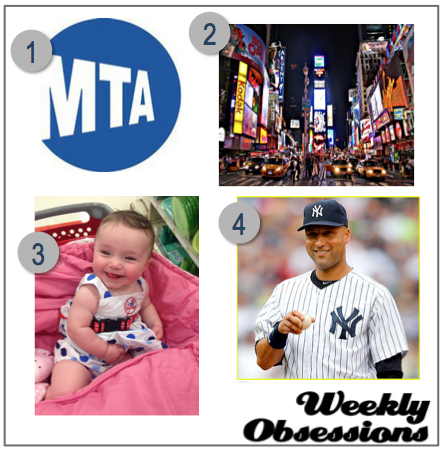 : OK, so she doesn’t live in New York, but she was born a Yankees fan so that totally counts. My favorite niece has brought nothing but joy and wonder to our family, and I can’t wait to celebrate many more years of her being adorable. DE-REK JE-TER: I searched the archives and have not specifically called out The Captain as an obsession. So there. His final home game is tomorrow, and his last at-bat will be in Boston Sunday. Regardless of wins and losses, I have nothing but love for my first-ever celebrity crush. Enjoy retirement, Jetes. You know where to find me. bensbitterblog says : 09.26.2014 at 3:15 pm.p. Wittyburg says : 10.01.2014 at 12:22 pm.p. Rice Wagner says : 09.25.2014 at 9:57 am.p. I wish you great success and fun on your next ‘leg’…oh, what a winding road we travel…and how exciting! Magz says : 09.24.2014 at 7:24 pm.p. A wonderful farewell to the city in which you always wanted to live. It’s been a good run, but now it’s time for you to do it your way all over again! As my friend Don Quixote would say, “More adventures and misadventures!” As tough is it will be to leave, I know you have an amazing future in San Francisco! And I have the utmost Re2pect for that! Time to fly Baby Girl! Wittyburg says : 10.01.2014 at 12:21 pm.p.